Kalee and Aaron’s romance is the thing love stories are made of – these two are high school sweethearts, where Aaron was a football player and Kalee was a cheerleader! For their wedding, they chose to exchange vows surrounded by friends and family on an October day in our garden. The bride walked down the aisle in an absolutely spectacular Watters gown with embroidered floral details, Jimmy Choo shoes, and a floral crown. Her bridesmaids dressed in coordinated gowns of blush pink while carrying burgundy bouquets of astillbe. 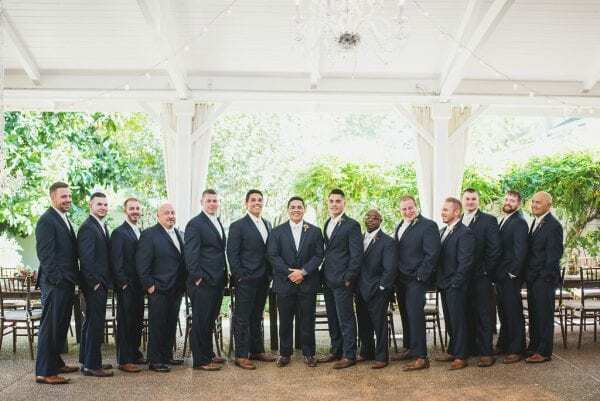 Ever the sports enthusiasts, the groom and groomsmen dressed in classic navy suits while wearing socks to support their favorite sports teams. The couple and their families ensured heartwarming personal touches were felt throughout their big day. The groom’s family is from Hawaii, so the couple paid homage to traditional Hawaiian culture by incorporating Hawaiian wedding traditions into their ceremony and reception. Aaron’s mother even surprised the couple by performing the Hula just before dinner! Their reception space featured rustic farm tables adorned in with chic centerpieces in pink, burgundy and rose gold. The evening ended with a three-tiered ivory cake featuring hand-painted gold flowers and accented by burgundy and blush blooms. Truly a fairy tale wedding! Thank you so much John Myer Photography and Brandon Rice Films for capturing the stunning details of this day. Enjoy!